Few festivals have escalated through the ranks as fast and ferocious as San Diego's KAABOO Del Mar. 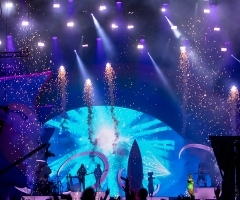 Over the past three years, KAABOO has been a milestone for the renowned Del Mar fairgrounds, welcoming only the best acts in music, comedy, cuisine and couture. Guests are dazzled the minute they step through the gates and long after the nightly headliner steps off-stage by acrobats, after parties and other creative stimuli such as interactive art murals. There's almost an unlimited amount of things to do at KAABOO on top of enjoying your favorite music, from wading in the soak zone pool to hot air balloon rides in the air to massages in the relaxation zones. You simply cannot be bored at KAABOO. You simply cannot be bored at KAABOO. 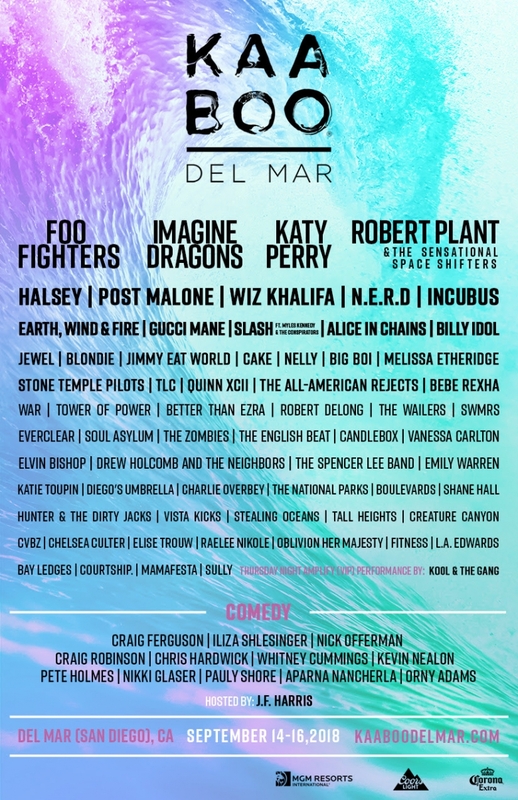 Headliners for KAABOO 2018 are venerable rockers Foo Fighters, accomplished alt-rock band Imagine Dragons, pop sensation Katy Perry and Led Zeppelin's revered frontman Robert Plant accompanied by his Sensational Space Shifters. Mind. Blown. Let's add in some Top 40 chart-toppers Halsey, Post Malone, Wiz Khalifa and N.E.R.D... some Y2k rock bands Incubus, All-American Rejects and Jimmy Eat World... some classic throwbacks like Earth, Wind & Fire, War and Elvin Bishop. Add a sprinkle of everything in between and you've got yourself a legendary lineup for the record books! More musical acts signed onto 2018 include Gucci Mane, Slash, Alice in Chains, Billy Idol, Jewel, Blondie, Cake, Nelly, Big Boi, Melissa Etheridge, Stone Temple Pilots, TLC, Quinn XCII, Bebe Rexha, Tower of Power, Better Than Ezra, Robert Delong, The Wailers, SWMRS, Everclear, Soul Asylum, The Zombies, The English Beat, Candlebox, Vanessa Carlton, Drew Holcomb and the Neighbors, The Spencer Lee Band, Emily Warren, Katie Toupin, Diego's Umbrella, Charlie Overbey, The National Parks, Boulevards, Shane Hall, Hunter & The Dirty Jacks, Vista Kicks, Stealing Oceans, Tall Heights, Creature Canyon, CVBZ, Chelsea Culter, Elise Trouw, Raelee Nikole, Oblivion Her Majesty, Fitness, L.A. Edwards, Bay Ledges, Courtship, Mamafesta and Sully. There's so much talent rolled into the 2018 lineup, it's almost overwhelming. If that's not enough, there's also a Thursday pre-party with disco heavyweights Kool & The Gang. Time to get down on it and secure your KAABOO passes before they sell out! There's so much talent rolled into the 2018 lineup, it's almost overwhelming. And, lest we forget, ticket admission doesn't only include the musical lineup – top comedians are coming to the 4th Annual, too! Gracing the comedy stage of KAABOO 4 will be Craig Ferguson, Iliza Shlesinger, Nick Offerman, Craig Robinson, Chris Hardwick, Whitney Cummings, Kevin Nealon, Pete Holmes, Nikki Glaser, Pauly Shore, Aparna Nancherla and Orny Adams. If these top names in stand-up don't get you rolling on the floor laughing, we don't know what will. 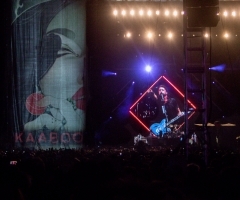 Even ticket sales set KAABOO Del Mar apart from the rest of the colossal music fests. 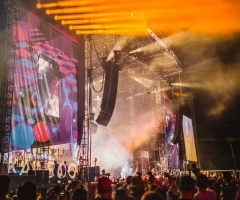 Although weekend tiered passes are on sale now – with tickets ranging anywhere from general admission all the way to VVIP passes (luxury doesn't even start to define THAT experience) – the KAABOO Kindness program gives back $1 from every ticket sold to support local San Diego charities. This fest is all San Diego, through and through. 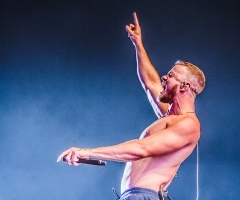 Thus, however you want to enjoy the MIX-perience, KAABOO Del Mar will accommodate you with their Hang Loose, Hang Five or Hang Ten packages.. and you have the added bonus in knowing you're making the community a better place simply by attending. For more information, visit www.kaaboodelmar.com.